William Keogh, a native of Athenry and a ganger with the Land Commission came to Oughterard and purchased Honri O Toole’s , Pub and Hardware shop as well as the adjoining buildings from Edward Sullivan. He married Mary (Mayno) Power from across the street. They carried on the business until his death in 1967 and Mayno’s death in 1983. They raised a family of nine children, Julie, Johnny, Fr. Joe, Ned, Fr. Hon, Tom, Liam, Mick and Nancy. In fact they had their own 7-aside football team with Andy Joyce taking Liam’s place (he was not interested in playing football). Liam ran the business until his death in 1981. The business was subsequently managed by Mick Keogh William’s son and in the year 2014 it is run by Justin Keogh son of Mick and Teresa Keogh. Their main business was carried on in the Square Oughterard but they also served the people of the wider region of Connemara with their Travelling Shop. In the early days Mayno went with the Travelling Shop and sold groceries and drapery. Later on Tim Molloy and Mixie Mc Gauley drove the van and John Healy acted as a helper. The van was cleaned and stocked Monday. All goods were tightly packed on shelves inside the van. It always seemed to have unlimited capacity and carried enough stock to cater for the needs of the villages. If a housewife needed some item not available in the van a note was made and it would be supplied the following week. Unusual items were often requested – bicycle tubes, hayforks, hay rakes, shovels, handles for spades, yard brushes, wellingtons and even glass for wind. People would request stamps especially airmail stamps and postal orders. 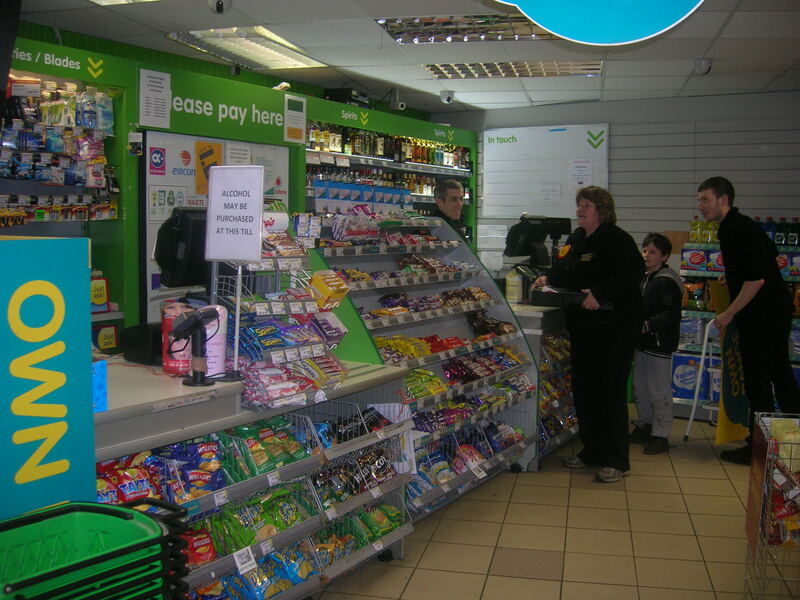 All again supplied with a smile and at no extra cost to the customer. Everything was done to serve the customer. Tuesday the van travelled to Leam, Maam Cross, Camus, Gleann Trasna, Muicineach idir Dhá Sháile up to Darby’s, Lettermore, Béal a Daingean and back through Seana Féistin. Wednesday it went to Glann, Thursday to Seana Féistin, Rosaveal and Baile na hAbhann, Friday to Rusheeney, Maghera and Coolighy and finally Saturday it went to Esker, Tullykyne and Collinamuck. There were few family cars in the area in the 50’s. Bicycles, pony and trap or horse and cart were the common means of transport. The women seldom came into town. They came only when essential commodities were required. They relied on the weekly call of the Travelling Shop. The women in Connemara derived an income from knitting and weaving for Millar’s in Clifden and Keogh’s Oughterard and from selling eggs, butter and tomatoes to the Travelling Shop. The Government at the time gave a grant to the Gaeltacht people to erect glasshouses thus earning a modest income from the produce of the green houses. Housewives sold their eggs, butter and tomatoes in exchange for paraffin oil which was need for the oil lamps and tilly lamps (as rural electrification hadn’t come to the region until the 50’s), flour, tea, sugar, bread soda – already weighed in various quantities, jam, plug tobacco, Rinso for washing, Nugget shoe polish, sausages and a special treat was the purchase of a loaf of bread. Women rarely bought butter as they churned their own butter and baked their own bread. Flour was bought in 10 stone bags and was used to bake brown bread, currant cakes, griddle scones, treacle bread, potatoes cakes and pancakes. The empty bags were washed and bleached and made into sheets, pillowcases, tea towels, simple T Shirts and even football togs. As John Healy said, ‘we often went to school with ‘Odlums Cream Flour’ or ‘Ranks Friendship Flour’ written across our backs! The traveling van brought bran for bread-making, bran mash for the cow in calf as well as bran mixed with potatoes for the animals. Indian meal was sold for the hens – the quality of the eggs depended on the quality of the ‘henfood’. Pollard, clarinda, flake meal as well as oatmeal were also sold. The odd bottle of whiskey and bottles of porter made their way into some households. Christmas was a special time for the traveling Shop. There was great excitement and anticipation when the Travelling Shop made its Christmas visit. Extra supplies were bought for the festive season – the makings of the traditional Christmas cake and pudding – raisins, sultanas, currants, brown sugar, caster and icing sugar, green and red cherries, candid peel, bottles of stout and bottles of whisky, red cordial and raspberry wine: not forgetting the various spices – nutmeg, cinnamon and cloves both ground and whole. Large red candles that were placed in the windows of every house were a must. Keoghs like every other shop at the time offered ‘The Christmas Box” which consisted of a large iced cake, large red candle, biscuits, bottles of orange and sweets which were give to the Bean a’ Tí in appreciation of her continued custom over the previous year. The drivers and helpers on the van brought news of births, deaths and marriages and the local gossip from village to village. Often they were the only outsiders the housewives interacted with during the course of the week. John Healy told me they had to be able to speak Irish to the women of Connemara. A lot of the shops were paid on the spot for goods received but often they kept a little book for each customer and the items purchased were noted in ‘the book’. Payment was made at a future date when dollars arrived from America or pounds from England, the sale of life stock or on receiving the pension or children’s allowance. Relations coming from abroad often called into the shops and asked to see their family book. If it was in arrears they would ‘wipe the slate clean’ before going away. In the 40’s and 50’s butter and eggs were used as freely as money is used at the present time. The eggs were packed in hay and then packed in timber boxes and later sold to egg buyers for export. In the 60’s eggs were about 2shillings to a half crown per dozen. How simple and personal were trading transactions then before the arrival of mini-markets and supermarkets? Mary Joyce, a school teacher who taught in Moate and daughter of Seano’s who lived in a thatched cottage near the Community Centre, came back to Oughterard to look after her mother and went to work for Keogh’s. She was dedicated to the efficient running of the business. In to day’s terms she would have the title of General Manager. Keoghs was the first delicatessen I encountered outside Lydon House in Shop St. Galway. 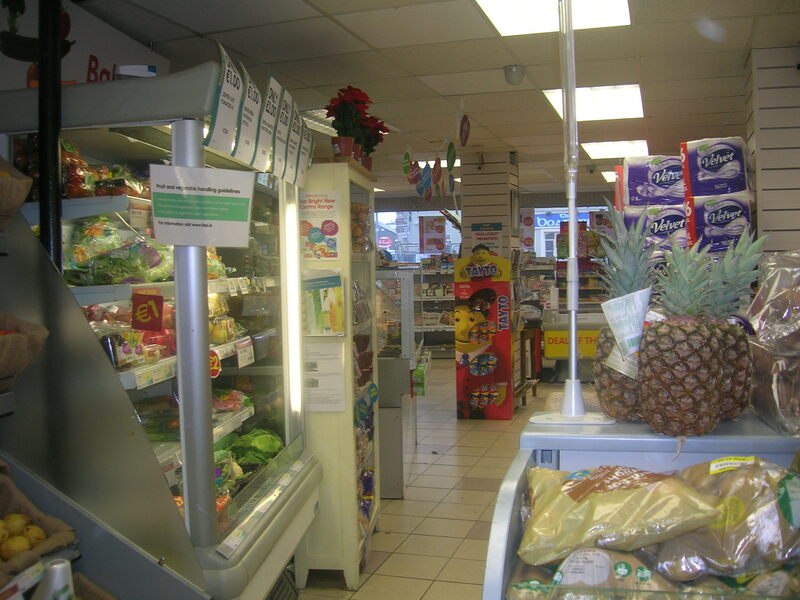 In 1967 when I arrived in Oughterard I was mesmerized with the foods and fruits I found in the shop. Mary Joyce enlightened me of their uses – vol au vents a puff case was filled with a variety of fillings often savoury, avocados were served stuffed, muscadels were large grapes with a musky flavour that were dipped in brandy by the gentry and eaten after dinner while smoking their cigars! This was all new to me a country girl used to plain food! The bar and hardware were at the back of the premises. Both establishments did a ‘roaring’ trade especially on fair days. They sold the usual drinks of whisky, port, raspberry wine and ginger beer. The hardware shop provided building materials for the newly constructed houses and extensions to existing homes in the Oughterard, Kilannin and Connemara area. Goods wee often supplied and no dockets were issued such was the trust William Keogh had in his customers. Goods were paid for on the arrival of the house grant. 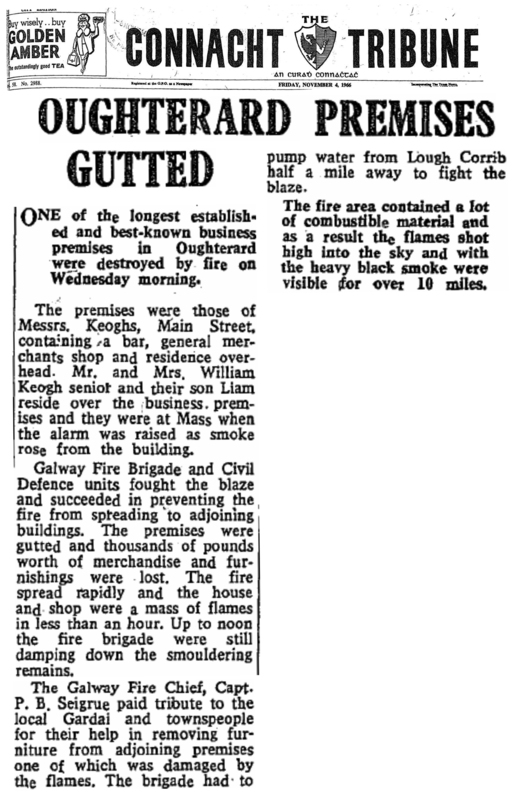 The people of Oughterard depended on the service provided by Keoghs and the Keoghs depended on the custom of the people. As the old Irish saying goes ‘Ar scáth a chéile a mhaireann na daoine” or “Ní neart go cur le chéile”. 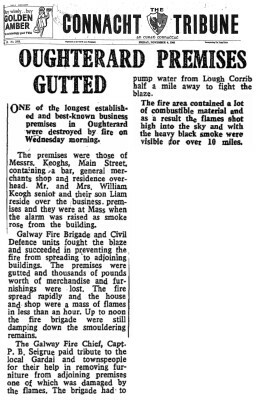 It was devastating for the parish the day Keogh’s went on fire. It was thought that the fire started in the kitchen area with a bucket of hot ashes. Seán Monahan has vivid memories of the fire. “I was getting the van ready to go to Clifden with Andrew Ferguson when we spotted the smoke about 7.30 in the morning coming from the kitchen area. We feared for the life of the housekeeper but later we found out that she had gone to Mass. We rushed to the premises and woke William and Mayno who were sleeping upstairs. William left in a hurry and then wanted to go back into the fire to get his false teeth but there was no going back. He was anxious to save the files, ledgers, books and safe held in the office. The office windows had iron bars and we had to cut them. The fire brigade arrived but the pressure of water was low. John Sullivan arrived and connected a pump down in the river but by this time the place was an inferno with the locals assisting the fire crew to salvage what they could. John Healy, a young boy at the time, sat with William Keogh on the stone bench outside Powers and listened to the tins of paint exploding and the corks of the spirit bottles popping. The smoke damaged goods were brought by every means of transport available to Jack’s Avenue (the avenue leading into Lemonfield House). The tin of money under the counter was thrown onto the street and damaged coins flew everywhere. The premise was burned to the ground. Next door there was concern for the safety of Annie Egan. Several attempts were made to gain entry to her shop but there was no answer. Finally a fireman broke the window and started to get her crystal glass and Beleek china, Connemara marble goods and other souvenirs out on to the Square. Annie had spent the night in Galway and arrived home to see the contents of her shop piled in the Square with men attempting to take beds out the top windows. “Keogh’s got a clean job’, she said “but I only got smoke damage”. The business had to be rebuilt and restored which was a great achievement in those hard times. When I asked my husband Frank Kyne did he remember the day Keogh’s went on fire he replied immediately. “That was the day the Baurisheen lads didn’t come to school. ‘According to Frank the boys usually came to school through the fields and went up along the river to the boy’s school. On this fateful day in 1966 seeing the plumes of smoke rise into the sky they went to investigate what had happened. Firemen blocked their way on Camp Street. ‘Go home lads there will be no school for you to day as you can’t go up the Main Street,” shouted the firemen. Of course they took them at their word, they didn’t go up by the river, they had a good excuse and went home. ‘Keogh’s bogs was the best business in Oughterard,’ said a former employee. When it was thriving Mick Keogh employed up to 200 workers some part-time and others full time like Frank Lyons, Tom Gibbons and Pius de Lappe. The plots of turf were 40yards long. In 1963at 12 years of age John Healy earned 6p a yard turning turf. This amounted to 10tonne of turf. It was considered good money for a youngster at the time. Michael Mc Evilly and his brothers worked on the bog from 9am to 6pm for £1 a day. Older men got £1.50 – £2. When they came to collect their wages on a Saturday evening Mrs. Keogh would tell them to go home and have a wash and ‘come up again a ‘maceens’ and I will give it to you. You can have a lemonade or orange here.” It was the custom at the time that people were paid in shops or in the pub as the shopkeepers wanted their workers to spend a little of their wages in their shops. My own children Francis, Mary, Ann Marie and Ursula all worked in the bogs in May and June. The girls earned the required amount of money that paid for their basketball camps in Dungarvan Co. Waterford while I am sure some of Francis’ money made its way into Keogh’s Bar! William Keogh had many strings to his bow. He bought the wool in this area from the sheep farmers. Frank Kyne remembers William at a Wool Fair in Clonbur bidding against his father Paddy Kyne for wool. Frank was only 12years old when he was sent on his bicycle two days before the fair to withdraw £700 from the Bank in Ballinrobe. £700 was a considerable amount of money in those days. His mother Annie gave him safety pins to secure the top and bottom of his inside jacket pocket. You couldn’t afford to lose that sum of money! At the fair the following day William Keogh offered a shilling a pound for the wool and Paddy Kyne raised it to a shilling and a farthing (a quarter of a penny) a pound. That farthing made the difference! Paddy Kyne got the farmer’s wool that day. Paddy Kyne was a buyer for John M. Joyce a wool exporter from Leenane. He used as most buyers did at the time a “Ready Reckoner” a little book with various calculations a fore runner to a calculator to calculate the amount due to the respective farmers. The wool was packed in large canvas bags and it was weighed at the Crane House in Clonbur. The wool in Oughterard was weighed on the weigh bridge in the Square Oughterard. Most of the packs of wool were accepted by the buyer at face value but farmers suspected of adding gravel or wool attached to the animal’s skin in order to increase the weight of the pack had their packs opened and searched. The Keogh family was a great supporter of every event that took place in the locality be it the Annual Agriculture Show, Oughterard Races, GAA, Boxing Tournaments, Basketball, Regatta and Community Games to name a few. On one occasion in the early 80’s the Community Games were struggling to find the money to pay for medals for the impending Sports Day. We decided to hold a Church Gate Collection. Mick Keogh came to me and said, ‘I have heard Mary that the Community Games was going to the wall’. Dropping £20 into my tin he said, ‘Don’t let anything die in Oughterard for the want of money.” He walked away and that was the £20 that helped us go forward with courage and conviction of what we were trying to achieve. 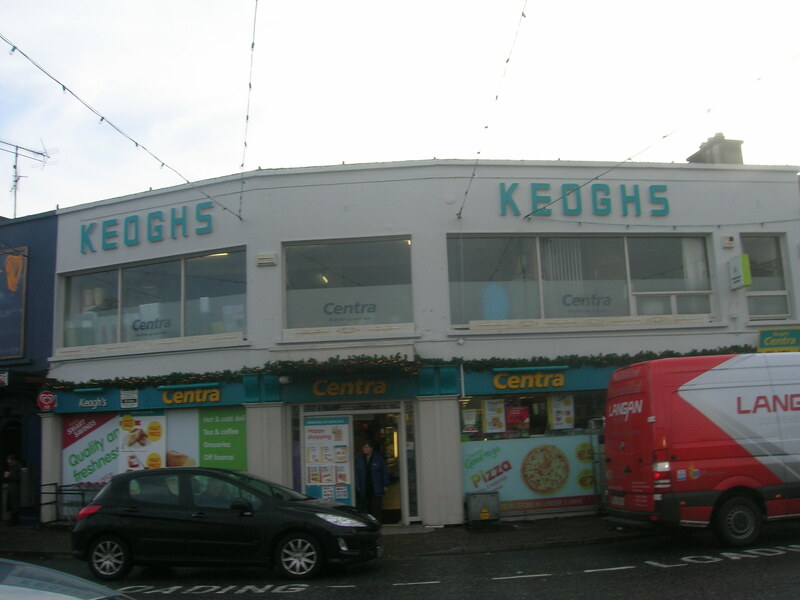 Keogh’s businesses were great employers in the area often employing whole families. All the people I spoke with had happy memories of their time working under the different management down the years. We wish the present management under Justin Keogh every success in 2014 and for many years to come. This page was added on 18/01/2014.